It is hard to believe that in exactly one month I will be packing my bags and getting ready to get on a plane for home! I expect this next month to be a bit of an emotional roller coaster. I am very ready to go home! I have always missed every one but now I am starting to miss every thing. I think it’s time to go back. But I have met some amazing people here. They are kind and thoughtful and very Asian!! They have shared so much of their culture and traditions and way of life with me that it will be hard to leave. On top of all of that, I have lots of work to do to wrap this project up and need to stay focused! This month is fairly unstructured because of all that work. I have a workshop to conduct and a few minor obligations, but my time is mostly my own. And that, in itself, is kind of amazing! It is a luxury I don’t think I have ever had. One full month to pull together my thoughts and ideas with minimal distraction. On the other hand, I am not very good with unstructured time and tend to employ an all or nothing approach. It has been more of an “all” phase for the past 4 or 5 days, and I have eight solid pages of the first draft of my guide to turning conventional labs into engineering design projects. Basically, my project involves putting more engineering into science classes and it is very opportune in light of the Next Generation Science Standards (NGSS). I have developed and teach an engineering course where the focus is the Engineering Design Process and the challenges and issues facing engineers. Science and math skills are introduced in that course secondary to the overall goal of engineering the artifact. That curriculum is also getting an overhaul as a side effect of all of this research and observations of the Singaporean system. But the real focus of this research is to develop a way to use the Engineering Design Process to provide a framework for active, project- based learning in science classes. In that case, the scientific concepts are the primary focus and the engineering component serves to keep projects both “hands -on” and “minds-on”. It also gives students a better sense of what engineers do. Decades of research support the idea that application of new ideas and concepts is invaluable in helping students to fully integrate and understand them. One of the issues with this more integrated approach is that very few high school science teachers have any background in engineering. The other problem is the tendency for projects to become trial and error processes and to succumb to what I call “the beauty contest effect” – where looking good becomes all that matters. So my completed project will consist of a paper with all of the research background (from literature and my work here) and rationale, the above mentioned “how-to” guide, and several fully detailed projects. In addition I have to write a summative report about the whole experience here in Singapore. 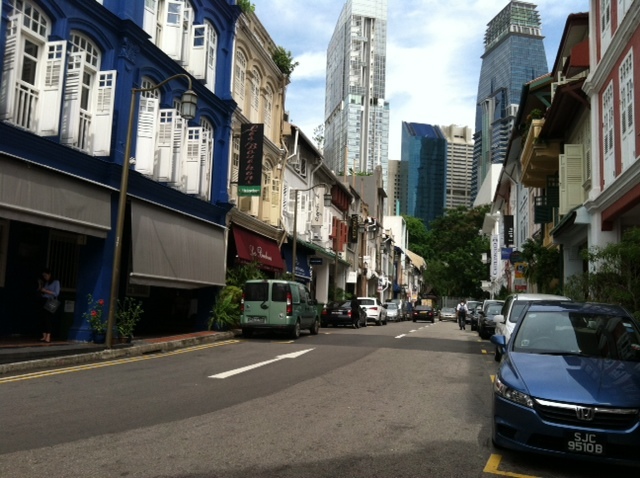 To guard against becoming a hermit and burning myself out, I have decided to launch a campaign to revisit parts of Singapore and wonder down some different streets and neighborhoods. It is nice to be able to go to certain areas on weekdays when they aren’t as crowded. Plus, it finally didn’t rain today and actually got pretty nice after a gray start. So I worked until 2 and then headed to Chinatown since I have never been there when it wasn’t raining, crazy hot or crazy crowded. It was quite pleasant. I picked up a few silly souvenirs (that is something else I have to start working on) and then went down a few streets I hadn’t really taken the time to check out before. One is an area called Club St. It is on a hill behind Chinatown and there are some really cool bars and restaurants in old restored shophouses. If I were young and happening, that would be my go-to area! It was pretty empty in the afternoon though. 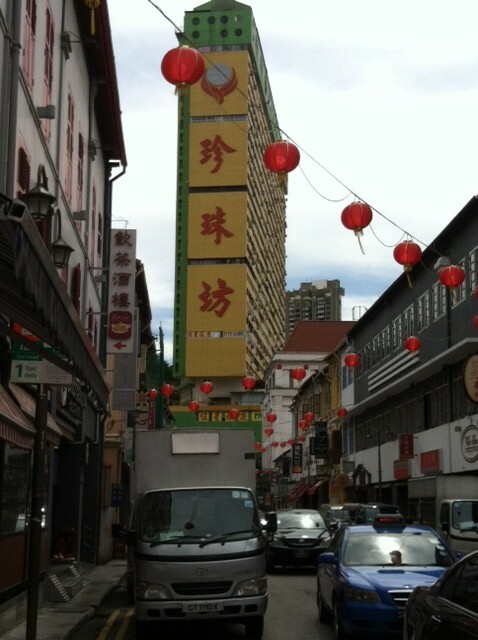 Here are some Chinatown shots from today. 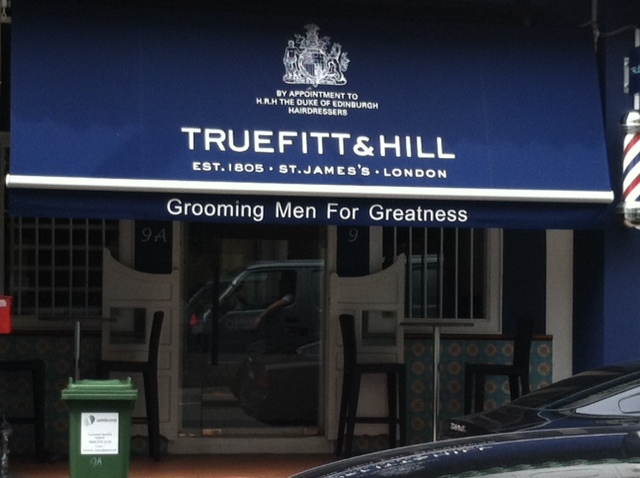 Every guy needs this place!! I wondered from there towards the area of Tanjong Pagar, which is sort of between Chinatown and the financial district. For some reason, I walked into the City Gallery, which is a place I don’t think I had really heard of before. 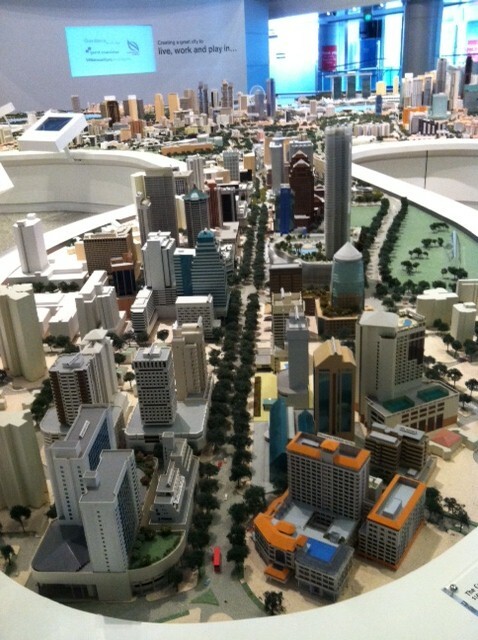 It has three floors of exhibits about where Singapore has been and where it is going. I don’t know if it would have been better to see it sooner, to get background, or now, when I know the lay of the land, so to speak. Anyway, it was really cool! Totally free! 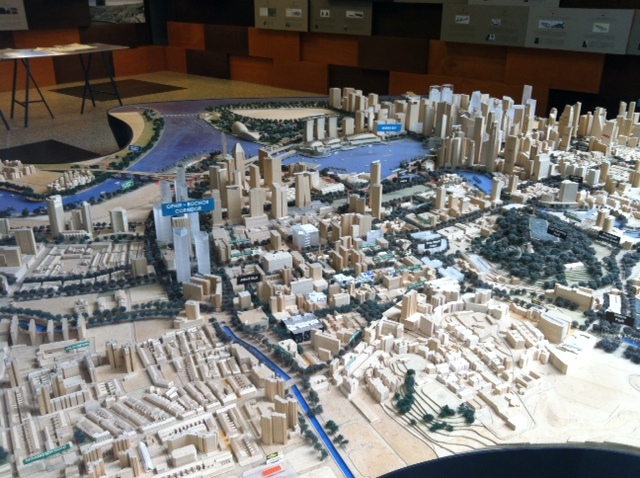 Lots of mini Singapore models, lots of history and some great interactive exhibits on urban design and planning. I may go back there and get some project ideas. I am going to see if any of my contacts at the Embassy or the Ministry of Education can put in touch with some sort of outreach person. I took a few photos. I am not sure if they will really mean much to any of you; it may be one of those “you had to be there” experiences. But maybe it will help get an idea of this amazingly transformed and engineered little island. Mini Orchard Rd. This is Singapore’s answer to Fifth Avenue. It looks nice without people – but I am sure that is not the idea! 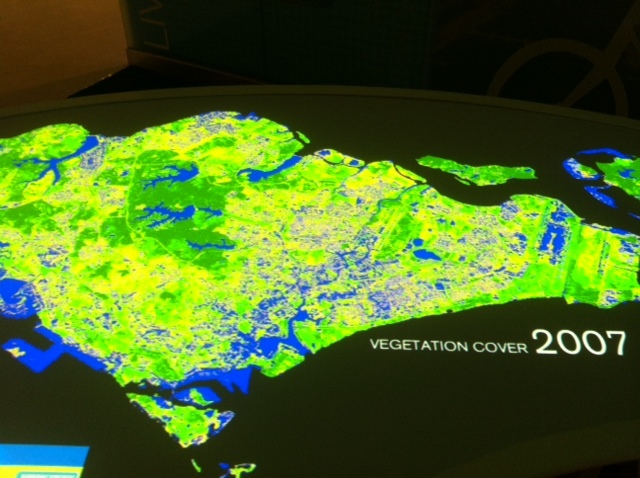 The Greening of Singapore. And it is increasing!! 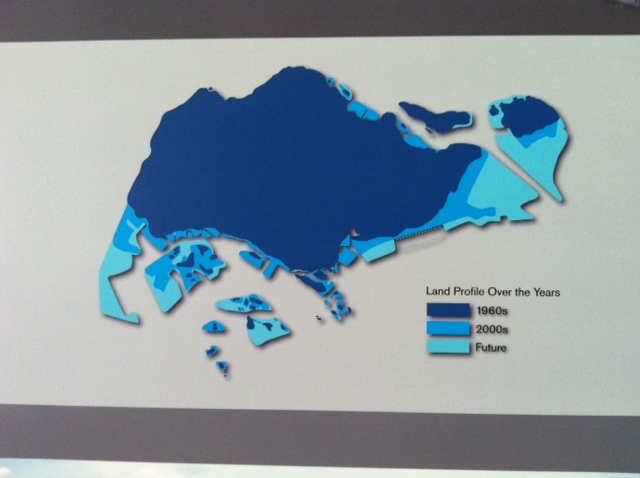 The growing of Singapore!! And it is also increasing! Major reclamation efforts in the past two decades and in the future. I did have a bit of a social life this weekend. 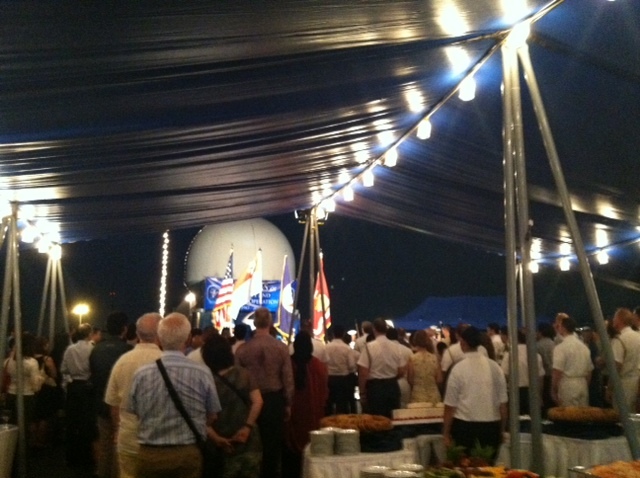 On Saturday, Katie and I were invited to a reception on the USS Blue Ridge, the command ship of the Seventh Fleet. Both the ship and the reception were smaller than the one we went to earlier. The invitation came from the US Ambassador and Rear Admiral Swift, commander of the Seventh Fleet. Very cool!! Once again, it is impressive to be on a ship like that for the playing of both the Singaporean national anthem and the Star Spangled Banner. The reception was on the Weather Deck, the top outside deck. The food was great and they had a Navy band with a sailor who was doing a great job channeling Adam Levine and Bruno Mars! But the most impressive part was the professionalism of the officers and the sailors and the pride they had in their ship. I had a great tour of the bridge and parts of the ship. The Admiral’s offices and quarters are in the center of the ship, like a highly secure bunker. He commands all the ships in the fleet from there (something like 90 of them). I couldn’t go in there, but I did get to see the helicopters used to transport him! Here’s a picture of the national anthem being played on deck. It was a terrific evening!